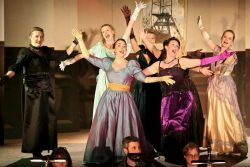 TWO of the silliest musical tales ever put on stage get a rousing, vivacious and thoroughly enjoyable performance by Milborne Port Opera in the company’s annual spring show at the village hall. 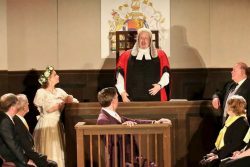 Fresh from their triumph in the 2017 Giant Coarse Acting Festival with a 15-minute masterpiece of country house mayhem, MPO is performing an expanded version of the utterly daft Murder At Shakerley House. The show was originally performed as a full-length comic opera in 2010 and returns in a shortened version with suitable “Play-that-goes-wrong” over-acting and collapsing sets. Confused? Try making sense of the plot! It is one of the most enchanting G&S confections, with some sweet arias, splendid choruses and great patter songs, and in the able hands of a cast led by Mark Blackham as the Judge, Rachel Milestone-McAdorey as Angelina the Plaintiff and James Craw as the Defendant, it is a delight from start to finish. Director Candice Marcus makes intelligent use of the whole theatre, bringing the stately Judge in his wig and robes down the aisle from the back of the hall, allowing the actor, with his wicked grin and mobile eyebrows to catch the eye of any female members of the audience. If you don’t know the plot, you would read the outcome in the Judge’s entrance. 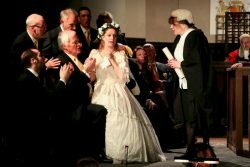 Having a largely female chorus of members of the press gives plenty for the MPO women to do, and plenty of interest for the Defendant who quickly focuses on a particularly flirtatious reporter (Jessie Stones), while the Foreman of the Jury (Chris Bailward) can hardly bear to let go when the Plaintiff collapses on his lap in her beautiful wedding gown. There are some nice little updatings and local references in the words and musical director Caroline D’Cruz keeps the music moving along at a spanking pace. 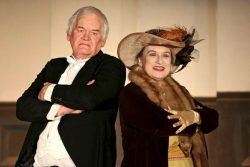 In the middle of all this are daughter Fanny Shakerley (Jessie Stones) and James Pitt (Anthony White), heir to the Pitt and Pasty Empire, who want to get married, but only if Fanny’s mother can be there and it is very much a case of “over Sir Hilary’s dead body” that the imperious Lady Winifred will return to Shakerley Hall. It is all very silly and very funny. There is a wonderful chorus of young, middle-aged and other assorted ladies, If You Haven’t Got A Man, and a hilarious duet for the semi-reunited Shakerley parents. In between there are wigs that don’t fit properly, doors that don’t open, entrances from the wrong side, paintings that fall off, harrassed CLODS stagehands and all the panoply of coarse acting laid bare and bleeding for our delectation. Hats off to MPO for a double-bill of musical delight. It runs to Saturday 7th April. Pictured: Scenes from both short operas, by Paul Gumbrell. Posted in Reviews on 5 April, 2018 .